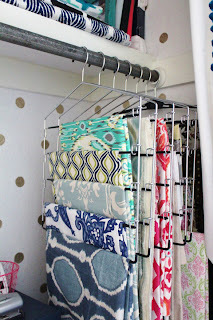 Every quilter loves fabric. Every sewer loves fabric. Not so sure as many love storing fabric. 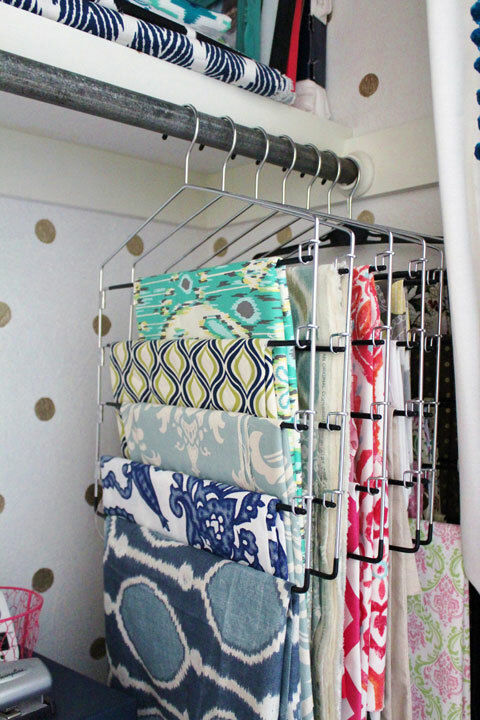 There's lots of theories as to the best way to store fabric. I don't think any of them are particularly wrong, just some work better for some people than others. 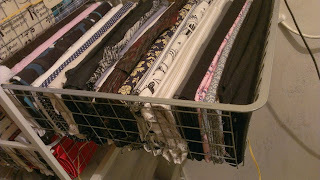 For example, I know some people store lengths of fabric on pants' hangers. That just isn't going to work for me. Firstly, I have too much fabric, secondly, I have too little hanging space (actually, none), and thirdly, I can't even use these things for pants without making a mess. However, I know this would work for some people. You might think fabric is pretty easy to store - just fold it, and stack it in a drawer or shelf or box. Ah, nice theory. My fabric collection is not limited to quilting cotton; it includes an array of dressmaking fabrics. Have you ever tried to fold organza? Or tulle? How do you stack leather offcuts? And if you stack fabric, I can almost guarantee that the piece that you think you want, will be the piece on the bottom. 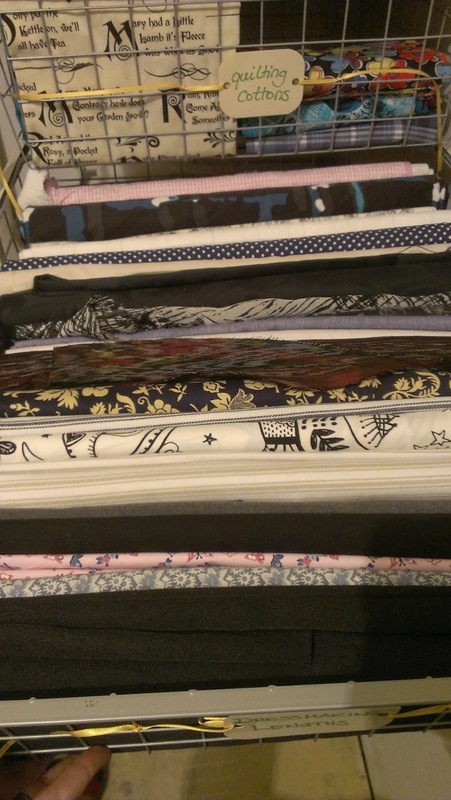 For the past eight years or so, most of my dressmaking fabric has lived in one of two places. 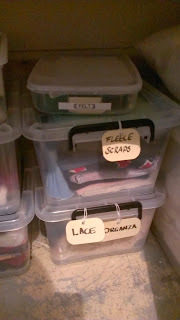 A big plastic storage tub for folded lengths, and a variety of 'stash holds' for everything else. A stash hold is any place where you stash something to deal with it later. The fabric in the big tub was stored vertically, and to find anything I had rifle through the whole lot, making a mess as I went. I've slowly gained more fabric in stash holds than any where else. My major stash holds were two large tubs in an Ikea drawer system. I'm hoping to not need the drawers once the sewing space is complete, so I had to deal with stash hold. I thought it would take forever, but it's actually only taken about 24 hours (minus sleep, cooking, taxi driving for the Teen). I dropped by our local "$2 shop" (ie the cheap bargain place). And I scored! They had small tubs, on wheels, with lids, for $4.50. They're about 11 x 14 inches, by 7 inches high. I decided these would be perfect for separating "speciality" fabrics - at the moment, organza, lace, stretch, fleece, and lining. This dealt with some of the harder fabrics to fold and stack. I may go back and a get a couple more. At the moment they're stacked under a desk, but they're small enough to go on shelves eventually. This afternoon I pulled out my biggest tub of fabrics and I ran a burn test on each piece. If they were cotton and a quilting texture I separated them out. Anything that wasn't cotton, or was cotton but not suitable for quilting, has now been designated as "dressmaking". The burn test is quite simple. You burn a snip of the fabric (with proper precautions - use tools to hold it over a fireproof vessel). If it is cotton it will smell like paper burning, the ash will be fine and powdery, and it will ignite when the flame gets close to it. If it is synthetic, it will smell like burning plastic (some bad fabrics smell when you iron them), it will melt near the flame, and the remnant will be a hard blob. 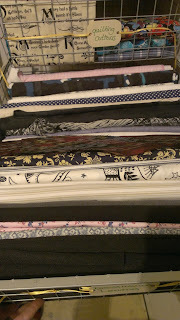 My smaller sized quilting fabrics are all already sorted, but a lot of lengths of cotton were mixed in with the big tubs. These I folded into 6.5 x 6.5 squares (near-ish). Simple process - folded them to a manageable size - no bigger than 1.5 x 1.5m, then wrapped it around my 6.5 inch wide ruler in one direction, removed the ruler and wrapped it the other way. 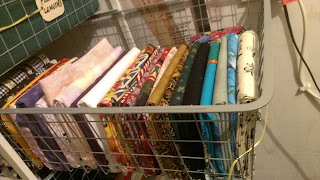 Ideally, I'd like to store these fabrics in smaller tubs, hence the size. In the short term, they're stored in a drawer of the Ikea system. Told you it was a small stash! My dressmaking fabric - anything that isn't cotton - I folded the width of the drawers, and a little shorter than the height (to allow for the folding to add to height). Coincidentally, I found a 14 x 4.5 inch ruler in the tub, which was the perfect size for folding around. I have two of these drawers, full of dressmaking lengths. After folding the large pieces I was left with a tub of 'bits'. I'm still deciding what to do with those. Some of them are big enough to be useful; if not for clothes, then for things like pencil cases and bags. The best way to store them is a problem for another day. The last task, and perhaps the most important, was to label everything. I found that labels help me store things correctly. It's not just that they help me remember what belongs somewhere, they also remind what doesn't belong somewhere. I'm far less likely to just 'stash' something if the label doesn't match what I'm stashing. If a label says "dress making scraps", I probably won't think, "Oh, I'll just put this length of fabric in there for the time being." For anything that's plastic, I love my label maker. 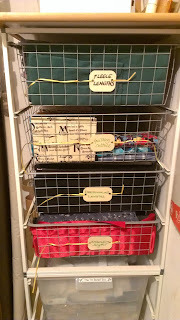 For the wire baskets and my storage tubs with handles, card on a string works well. I have corner punch, which rounds off the corners. It's a minor detail, but I think it makes the labels look nicer. 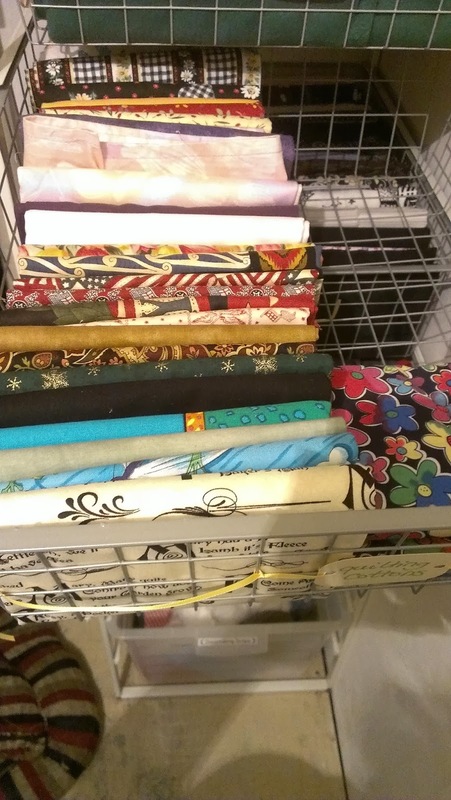 I have no idea what I do if I buy more fabric - I have no more space in the drawers. 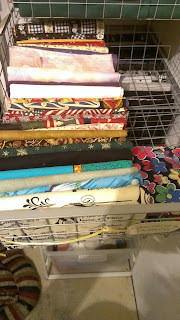 Mind you, I've got so much fabric in the drawers that should be used, I probably shouldn't be buying more fabric anyway. If you've got a blog post on storing your fabric, or a favourite system, I'd love to hear about it.